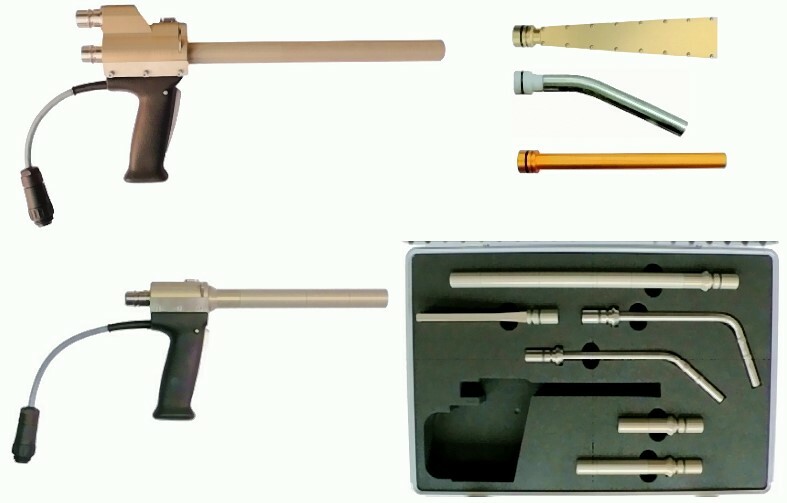 Device or equipment for blasting using solid carbon dioxide (CO2, see Dry ice). The dry ice blasting unit comprises the blasting device with the CO2 pellet container (Fig. 1), the connection to the compressed air supply and a blasting gun (Fig. 2) or blasting hose (ASCO offers blasting units with a one- and double-hose system, each with positive pressure). 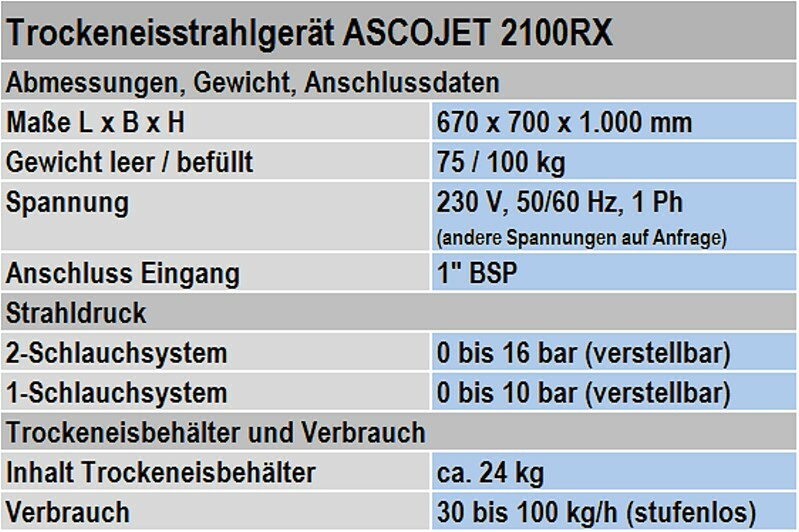 Foundries mainly use the most powerful one-hose system (ASCOJET 1701) and the 2-hose system (ASCOJET 2001RX). The blasting gun is used to spray dry ice pellets onto the surfaces to be cleaned. The technical data of a blasting unit are given in Table 1. Basically, a dry ice blasting unit and the dry ice blasting principle can be used for removing all materials exhibiting intense reactions to temperature differences. Paints, varnishes, adhesives, oil, wax and separating agent residues, bitumen, plastic deposits and foam (e.g. PU), etc. are readily removed without damaging the surface. Even sensitive objects such as switchboards or other electrical components can be cleaned. The dry ice blasting method is considered to be non-abrasive, i.e. in contrast to conventional blasting methods using sand or glass beads, the cleaned surfaces are not damaged or altered. Therefore, the use of a dry ice blasting unit is especially suitable for the gentle cleaning of ally kinds of molds (e.g. gravity dies, core boxes, die casting molds, etc.). As an example, closing surfaces in gravity dies are not rounded, avoiding burring to occur.